Many celebrated the death of the Warlord of Atun. Many others feared that he would not remain interred for long and sought to destroy and desecrate his remains. Eventually (after a series of adventures involving the theft, bisecting, separating and eventual rejoining of his corpse) those faithful to his vision, aided by those who felt the world was better off just forgetting about him entirely, finally buried him quietly with wards to prevent others from finding the corpse. Less than two hundred years later, the tomb and even the conquests of the Warlord of Atun have been lost and forgotten. But the caves where the tomb was hidden has been found by others – extra-dimensional invaders who despoil the area and raid the nearby towns. But even they have learned to avoid the finished tomb structure at the back of the caves, for traps and magics make the area unsafe to all. The rest of the caves, however, have been converted into living areas, a staging and planning room, slave pens, refuse pits and everything you would hope to avoid when dealing with extra-dimensional invaders. This cave map is one of four maps I put together for the first adventure release from Grey Fey. 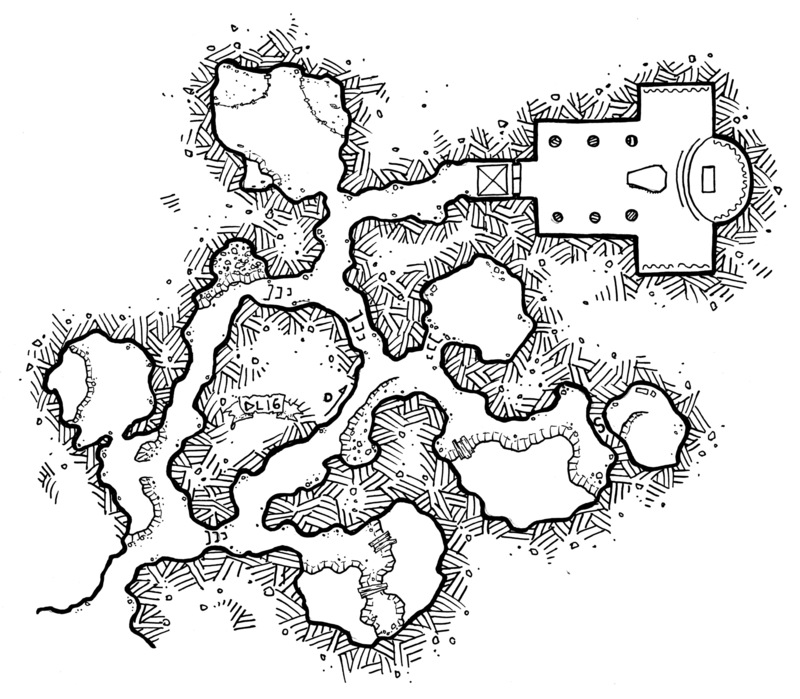 In the module – “Adventure Most Fowl” – the caves have have been detailed very differently than in the article above, tying in with the rest of the adventure and the nearby village of kith. It is available now at RPGnow. Of course, you are free to take this map as presented and use it in your home games with or without the rest of Adventure Most Fowl or the alternate background above. Definitely one of my favourite maps you’ve created almost solely for that reason! So much good material to work with.